WASHINGTON (AP) -- Andrew Puzder said he is withdrawing as President Donald Trump's nominee for labor secretary. The fast food executive said in a statement provided to The Associated Press that he was "honored to have been considered by President Donald Trump to lead the Department of Labor and put America's workers and businesses back on a path to sustainable prosperity." 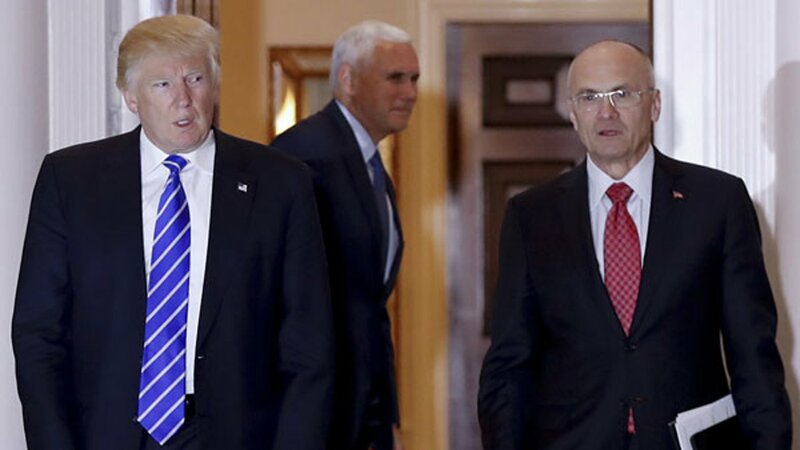 Puzder said, "while I won't be serving in the administration, I fully support the President and his highly qualified team." Puzder's confirmation hearing was scheduled for Thursday. But some Republicans had raised concerns about his failure to pay taxes for five years on a former housekeeper who wasn't authorized to work in the U.S.
Puzder is CEO of CKE Restaurants Inc.
President Donald Trump blamed the media and "illegally leaked" intelligence information for bringing down his national security adviser Michael Flynn. President Donald Trump on Wednesday blamed the media and "illegally leaked" intelligence information for bringing down his national security adviser Michael Flynn, one day after the White House said Trump had asked Flynn to resign because he misled Vice President Mike Pence about his contacts with Russia. Flynn's ouster has sparked a new swirl of controversy over Trump's potential ties to Moscow. Flynn resigned Monday night - at the behest of Trump, the White House later said - after reports that he had discussed sanctions with Russia's ambassador to the U.S. before the inauguration, despite previously denying those conversations to Pence and other top officials. But in Trump's first public comments on Flynn, he appeared to side with his former aide, saying it was "really a sad thing that he was treated so badly." Flynn's ouster was a blow to a White House struggling to find its footing in Trump's first weeks in office. The questions about Russia only deepened late Tuesday when The New York Times reported that U.S. agencies had intercepted phone calls last year between Russian intelligence officials and members of Trump's 2016 campaign team. Current and former U.S. officials who spoke to the Times anonymously said they found no evidence that the Trump campaign was working with the Russians on hacking or other efforts to influence the election. Trump didn't directly address the veracity of the report during a news conference with Israeli Prime Minister Benjamin Netanyahu, but lashed out at what he called the "criminal act" of leaking information. Earlier Wednesday, Trump tweeted that "classified information is illegally given out by 'intelligence' like candy. Very un-American!" The president ignored shouted questions about whether his advisers were in touch with Russian officials. His spokesman Sean Spicer said he wasn't aware of any such contacts and panned the Times report for relying on "unnamed sources." Democrats called for an independent investigation into Trump's Russia ties and urged Republicans to join them.